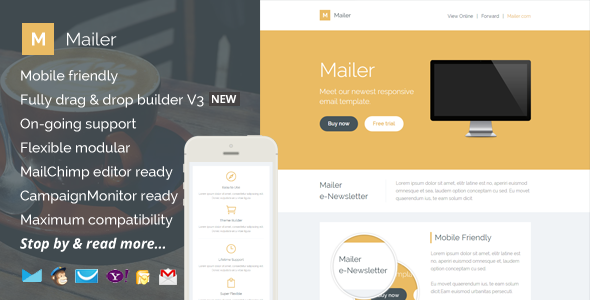 Mailer is a responsive, minimalist email marketing template packed with bunch of features. Free online template builder / editor access, MailChimp ready templates and Campaign Monitor templates are also included. Mailer comes with flexible and repeatable modular, you can arrange the layout and build your own unique template easily. -Add & remove modules, easily with Campaign Monitor Ready editor. Free access to our new, simple, easy-to-use & powerful Template Builder. Ready for Campaign Monitor and MailChimp, powerful template editor! 18 unique flexible modular that you can very easy to remix them to create your own layout.